How many bonsai styles do you know? Could you tell bonsai forms and styles apart? While many bonsai hobbyists use these two terms interchangeably, some believe there’s difference between those two. 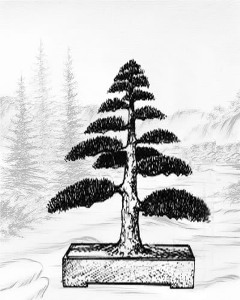 The latter group explains that bonsai forms describe the basic shape of trees as defined by direction of the trunk line relative to the horizontal plane of the pot. 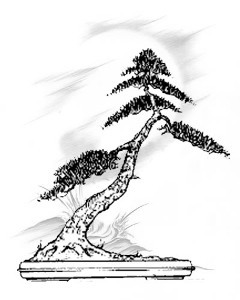 Meanwhile, bonsai styles describe the way in which a tree has been displayed. In either way though, there’re five basic types. You may call them five classic bonsai styles or bonsai forms, it’s up to your point of view. Fortunately, their names are obvious in both English and Japanese, though you may name them styles or forms. For the sake of convenience I will consider all of them bonsai styles and discuss one by one below. This is the most formalized bonsai style. The Chokkan trunk is perfectly straight and upright, although very little movement is allowed in the trunk line. In nature, formal upright trees usually grow in advantageous conditions, without facing the problem of competing trees or of harsh weather conditions like storms, floods, or lightening. The trunk in this style, therefore, must be thicker at the bottom and taper naturally and evenly from bottom to the top. The lowest branch should begin at about a quarter of the height of the trunk. The branches should be arranged alternately either side of the trunk with every third branch to the rear. Besides, the internodes as well as the length and thickness of the branches should diminish gradually toward the top of the tree. The best species for training the formal upright form are larches, junipers, pines and spruces because of their naturally tapered shape. 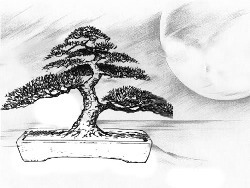 Informal upright is probably the most popular style in bonsai art as well as in nature. The Moiyogi trunk is not straightly upright, but bended, twisted, and slightly zigzags upward. The top of the tree, its apex, is usually positioned directly over its base, so overall effect is that of an upright tree. Tapering of the trunk must be clearly visible, with the base of the trunk thicker than the higher portion. Branches tend to emerge from the outside of bends. Faulty branches emerging directly from the inside of bends often look awkward. In nature, trees with this form must adapt to imperfect environmental conditions, e.g. to grow away from wind or competing trees, or to bend towards sunlight. The trees in slanting style lean to the left or right as a result of exposure to strong wind or deep shade. The trunk is usually straight or gently curved, but still thicker at the bottom than at the top. With the apex on one side, the tree may look unstable. 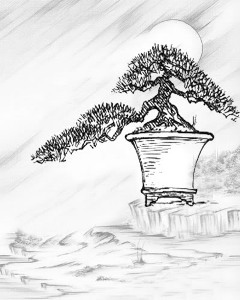 Thus, the surface roots (nebari) in this style should be clearly visible. The roots on the side to which the tree’s leaning should be short and compressed while the roots on the opposite side should be strong and dominant in order to create a sense of visual balance. 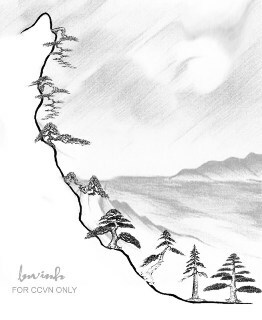 Cascade bonsai mimics the look of a tree growing on a river valley or clinging to a steep cliff, where harsh conditions like snow, wind, and falling rock cause the tree to bend downward. As natural tendency of the tree is to grow upright, it can be difficult to maintain a downwards-growing tree. The species chosen to train Kengai style should not strongly upright naturally. Juniper is a favorite for training in the cascade and semi-cascade styles. Just like cascade form, semi-cascade style also imitates the form of trees in nature which overhang cliffs or banks of rivers. The difference is that han-kengai trunk does not grow down the bottom of the pot. Rather, it only reaches the rim of the container. This bonsai style can be created with or without a crown. The crown, if any, is usually above the rim of the pot while subsequent branching occurs below the rim. 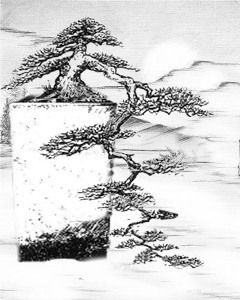 Besides above five classic bonsai styles (or forms), bonsai artists are not bound by those definitions. Rather, they create many popular gorgeous styles e.g. broom, literati, windswept, etc., which will be discussed in a separate page. Which bonsai styles do you love? Each hobbyist prefers certain bonsai styles. I myself love the Formal Upright the most, because it's somewhat similar to my personality, I guess. How’s about you? Which styles do you prefer, and why? Do you want to share some photos of your lovely bonsai styles? Other bonsai lovers and I are eager to see them.